In our last two articles we’ve focused on the notion of gamescript sensitivity. Some running backs (primarily early-down thumpers who aren’t used much in the passing game) perform better for fantasy when their team is holding a lead, while other running backs (primarily scatbacks or pass-catching specialists) perform better when their team is trailing. We identified these running backs and their ideal gamescript situations here. The purpose of this article was to look for specific trends that might help us make better decisions in DFS or when making start/sit decisions in redraft leagues. However, this also raised a second question. Who are the team’s gamescript-proof every-down running backs? Which running backs are used in all facets of the game? If a running back was used as both the primary early-down runner and primary passing-down-back, they should be wholly immune to game script. 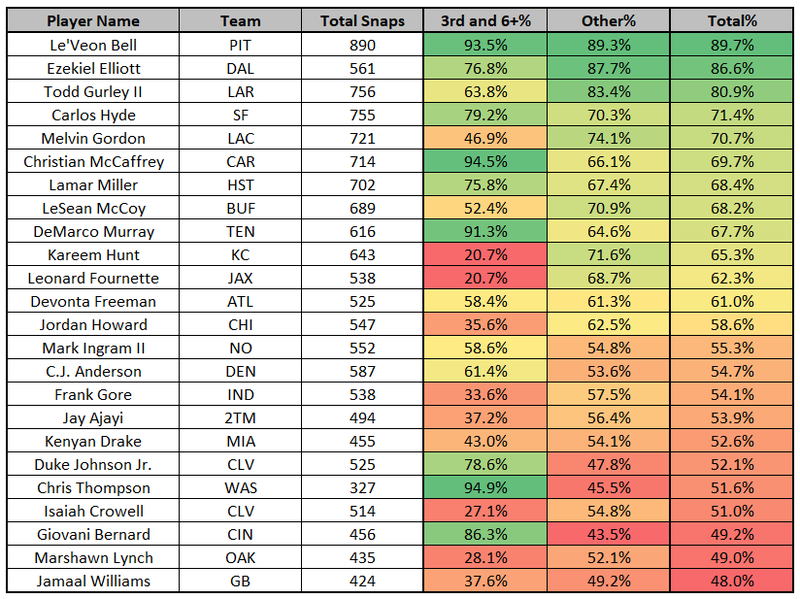 To determine this I looked at all running backs to play on at least 300 snaps last season, and broke down their splits in games played by percentage of total snaps (the below chart is sorted by this), their percentage of total snaps on obvious passing downs (third down with six or more yards to go for a first), and then their percentage of total snaps in all other situations (Other%). So who were the league’s every-down running backs last season? This one’s obvious. Despite missing 18 regular-season games since entering the league in 2013, Bell still leads all running backs in total snaps played. Over this stretch he averages 10.4 snaps and 3.9 touches per game more than any other qualifying running back. Basically, you’d have to spot LeSean McCoy, No. 2 in total snaps over that time, an extra free quarter of football per game in order to match Bell. Last season Bell played on 91.0 percent of the team’s running back snaps, totaled 87.2 percent of the team’s running back carries, and totaled 100 percent of the team’s running back targets. Although Elliott played a high number of snaps and a high number of snaps on obvious passing downs, this didn’t translate into more receiving volume. Over the past two seasons, Elliott ranks last of 48 qualifying running backs in targets per route run. The team also traded for Tavon Austin during the draft and has indicated a desire to use him as their scatback, getting him the ball “12 to 24 times per game.” While there’s absolutely no chance Austin comes near those touch totals, his presence is a concern for Elliott’s PPR value. Despite Los Angeles winning by 25 or more points in a whopping 33 percent of Gurley’s games last season, he ranked third among all running backs in snap share. He was also heavily used in obvious passing downs. Gurley came into the season with 64 career receptions, but then put up that total in 2017 alone. It paid dividends for Los Angeles and fantasy owners alike. Los Angeles went from last to first in points per game and Gurley averaged 9.5 more fantasy points per game than he did a season ago. Hyde came into last season with 64 targets across three seasons in the NFL. In one year under Kyle Shanahan he totaled 88 (fifth-most at the position). Hyde also drew 240 carries, which ranked 11th-most. Despite the good volume, Hyde underwhelmed in efficiency, grading out 50th of 58 qualifying running backs. With Hyde now in Cleveland, competing for touches with Nick Chubb and Duke Johnson, his ADP has rightfully plummeted. Jerick McKinnon’s draft stock has gone in the opposite direction, however, after signing the fifth-most-lucrative running back contract in the NFL. He seems poised to be an every-down running back and fantasy stud for San Francisco in 2018. Despite ranking highly in targets, Gordon was out-snapped by the combination of Austin Ekeler and Branden Oliver in obvious passing situations. In spite of this, Gordon still benefited more from negative game script than positive gamescript in 2017. He also ranked seventh at the position in targets (73). While not a true every-down running back, he is a bell cow, and is well worth a top-20 pick in your fantasy drafts. McCaffrey ranked highly in all categories, but this was also skewed by Carolina frequently having multiple running backs in the backfield on any given play. In reality, he was mostly just used as a scatback. 41 percent of McCaffrey’s touches came via the air last season, which ranked second-most of all 100-touch running backs. He also performed much better for fantasy when his team was trailing. Still, this was the far more productive role, with McCaffrey finishing eighth among running backs in expected fantasy points to Jonathan Stewart’s ranking of 31st. It’s possible McCaffrey’s role expands in year two – he was far more effective as a runner in college than in his rookie year – but after the team signed C.J. Anderson in free agency, it’s more likely he reprises a similar role to 2017. Miller looked like an every-down running back last season, but he was out-snapped by Alfred Blue 93 to 63 over the team’s final three games. I’m predicting more of a committee-approach for Houston in 2018, but Miller should remain the team’s primary pass-catcher even if that is the case. For the second straight season, Murray served in the more valuable role in Tennessee’s committee alongside Derrick Henry. In one fewer game, Murray drew eight more carries and 30 more targets to Henry. Dating back to college, Henry has rarely ever been used as a receiver, and I don’t expect that to change in 2018. For this reason, I suspect Dion Lewis will slide into Murray’s role while Henry reprises his role as the primary early-down bruiser. Needless to say, I’m much more excited about Lewis at ADP (RB27) than I am Henry (RB17) in PPR leagues. It’s important to note Hunt’s presence on this chart. Despite ranking eighth among running backs in receiving fantasy points and 11th in targets, he was frequently getting taken off of the field in favor of Charcandrick West on obvious passing downs. Although there’s concern Hunt might lose some early down work to Spencer Ware, the team has continually indicated [1, 2] a desire to get Hunt more work as a receiver this year, despite his deficiencies as a pass-blocker last season. 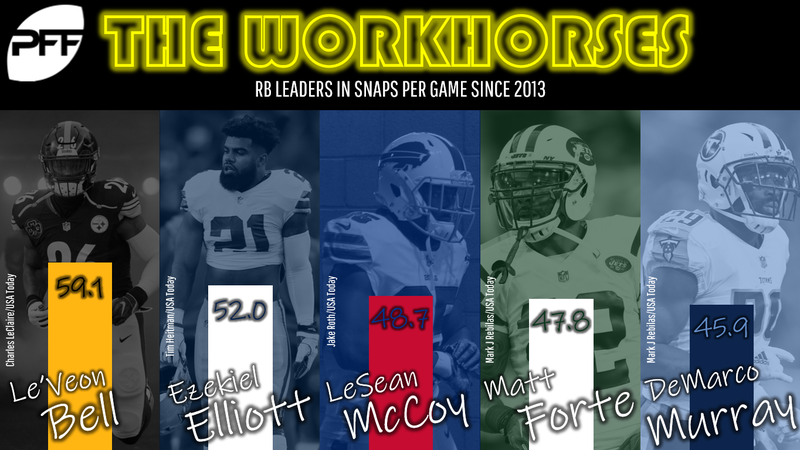 The increase in receiving work will be important in helping to offset any potential decline in carries, considering in PPR leagues, a target is worth 2.64 times as much as a carry for fantasy running backs.